A pre-Pride rally culminates with a die-in on the steps of Portland’s City Hall. Image description: Groups gather with banners on the steps of City Hall before the Pride Parade. 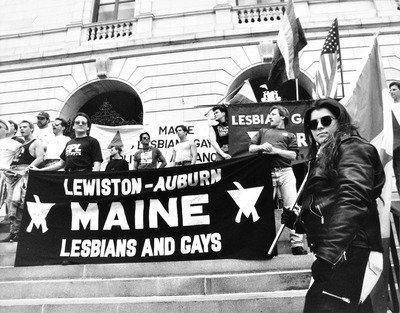 Group in the foreground is the Lewiston-Auburn Maine Lesians and Gays.